My foodie friends and I spent one sunny afternoon in one of the newest foodie spots in Pasig City: Gastro Park Kapitolyo. Gastro Park Kapitolyo is an expansive (not expensive) space with 15 food stalls of different cuisines and specialties, wooden tables and chairs, and music. El Phante is a stall that offers a fusion of Thai and Mexican flavors in their dishes. We got the Sriracha Carnitas Soft Tacos (Php 150) and the Pad Thai-Mex (Php 175). level of spiciness was adequate for me. I would love to have this again. The Pad Thai-Mex was also spicy, probably leaning more on the Mexican flavor than Thai. If you love your Pad Thai with more herbs and spice, this one is for you. Niku-Q is a promising yakitori stall with amazing yet sizeable choices. My friend got sticks of Chicken Thigh or Momos (Php 40), Pork with Asparagus or Asuparabekon (Php 45) and Angus Steak (Php 60). They probably used the same marinade for all meats, but hey, it works so why change it. Named after the area they are located, Tolyo serves mostly wagyu beef dishes. We tried their Grilled Wagyu Beef with Rice and Egg (Php 150). The meat was tender, alright, but it could have been juicier and flavorful if it was cooked until medium rare, and not well done. Brick Plate offers comfort food like pasta, ribs and pizza. We had their Pulled Pork with Veggies Pizza (Php 145). Their pizza reminded me of the local pizza that started during the 1980's. For the price, it was good enough and the serving is more than enough for 3 persons. Bagneto specializes in Filipino dishes served with bagnet, an Ilocano deep-fried pork dish. We ordered the Kare-Kareng Bagnet (Php 135), served with rice and bagoong. We only tried the Gyoza (Php 80) from Jap Box, which didn't look like the gyoza that I love eating. Jap Box also has misono, teriyaki and donburi, which I would prefer to try when I have the chance. The Seventh Element serves liquid nitrogen ice cream and coffee. Since I was feeling quite full, I had their Hazelnut French Press (Php 50). I love that the French Press was served on our table, complete with sweeteners and creamer. I must say that the coffee was amazing and hazelnut flavor was spot-on. I should try the ice cream next time. One of the most popular stalls in Gastropark is Sweet Nothing, which serves juices, milkshakes and desserts. We tried the Strawberry Shortcake Shake (Php 120) and the S'mores Milkshake (Php 120). Though I'm biased with chocolate, I was more impressed with the Strawberry Shortcake Shake, topped with cotton candy. I enjoyed sipping the Strawberry Shortcake Shake more when I mixed the cotton candy with the shake. However, the service was quite slow because they ran out of vanilla ice cream at some point that they needed to buy more. I do hope they'll fix the supply problem soon. 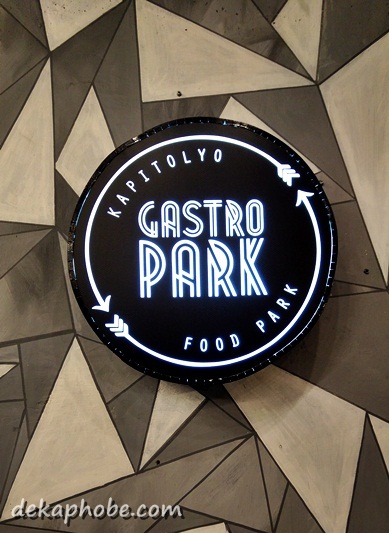 We had a great time trying out various dishes and drinks at Gastro Park Kapitolyo. The prices are reasonable and the choices are numerous that one visit is not enough to try everything. I would love to visit this again and try out more food stalls soon. Ooh... I'd love to try the Strawberry Shortcake Shake, because of the cotton candy. It looks really cute!